Windows only software Battery Care helps the user manage laptop batteries in a better way by providing detailed information and advanced functionality that the operating system does not offer. The program is compatible with most Microsoft operating systems including the soon to be released Windows 7. Basic details are provided in the applications main window. 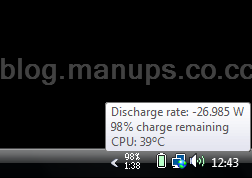 This includes the remaining battery capacity, the remaining battery time, the battery status, battery charge cycles and the cpu temperature of the laptop. It is easy to switch to detailed information which add information about the total, designed and active capacity of the laptop in mWh, the charge and discharge rate of the laptop battery, the tension, wear level and last calibration date. One of the most interesting functions of Battery Care is without doubt the monitoring of the battery’s discharge cycle. The program will suggest a full battery recharge every 30 discharge cycles. The software to manage laptop batteries can also be configured to automatically switch power plans based on the power source of the laptop. The remaining battery time and charge percentage is displayed as a icon in the Windows system tray with additional information being displayed in a popup. 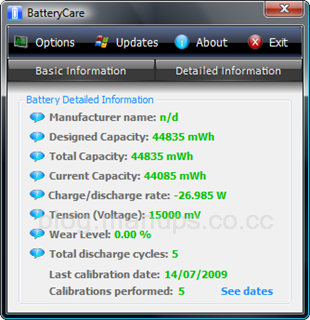 Battery Care is an excellent laptop battery manager for the Windows operating system.